Lose yourself in fantasy with this unique decanter inspired by voyages across the ocean. 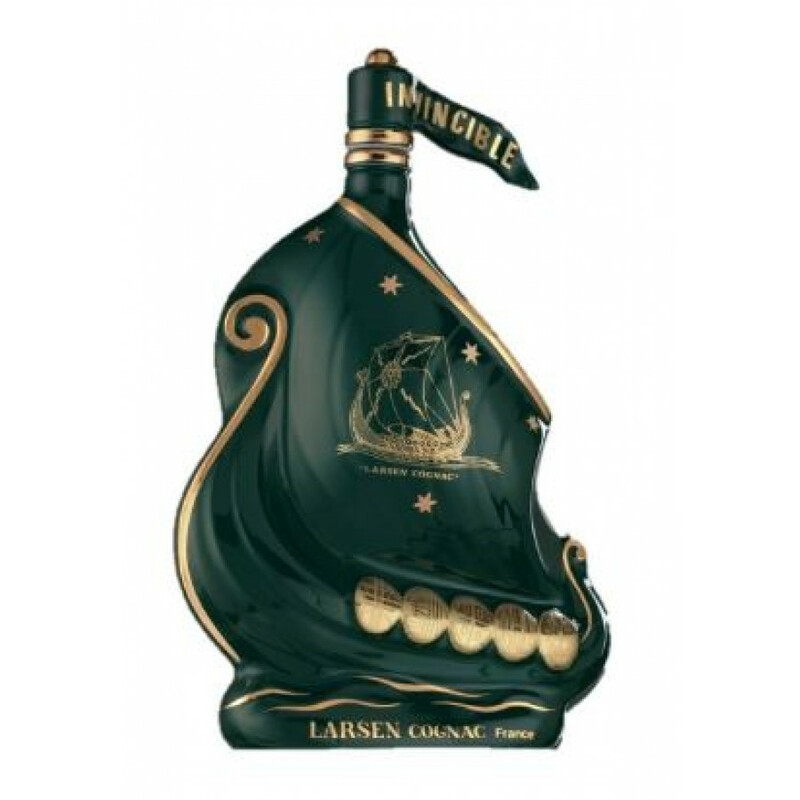 The Larsen Viking Ocean Cognac 70cl is a wonderful collector’s item or a one-of-a-kind gift. Arriving in a nautical ship-shaped decanter made of precious Porcelaine de Limoges, it is an iconic member of the Larsen Cognac collection. It is handpainted with 24-carat gold on to glass by artisan craftsmen, and gives an insight into the deep-reaching and oceanic history of Larsen Cognac. A decorative decanter that will make a great talking point with friends and family. Contained within is a Fine Champagne blend, between the Grande and Petite Champagne terroirs. The assemblage remains the same as it was in 1952 when the Cognac was released, with a precious symphony of eaux-de-vie. The Fine Champagne region, or the two neighboring crus, are highly reputed in the Cognac world. They are known for producing the finest of Cognacs, thanks to a unique geological make-up of the earth in this maritime climate. The high chalk content means that the soil drains easily; producing light and floral eaux-de-vie with a lengthy finish such as that as the Larsen Viking Ocean. It is only fitting that the Viking Ocean Cognac should be in the shape of a ship. Jens Reidar Larsen set out to the Americas aged 24, eager to explore the world, but a stopover in Bordeaux seemingly changed the course of his path and destiny. He found a job in a town famous for its eaux-de-vie, and subsequently fell in love with a local girl. His new adventure began in the town of Cognac. He learned the secrets of the cellar masters and explored the treasures of eaux-de-vie, creating Larsen Cognac in 1926. Lose yourself in the fantasy and maritime adventure of this Cognac by enjoying it neat with a small group of close friends. This ship decanter is unique; like nothing you’ve ever seen. Adorned in an ocean or seaweed green and 24-carat gold, the stopper is a flag denoting the word “Invincible”, and below are a number of crests. It is bottled at 40% ABV.